The human body cannot produce vitamin C. Therefore, it is important to get your daily dose of this vitamin from fruits and vegetables and supplements. Studies have reported that getting enough vitamin C reduces high blood pressure. It boosts the production of nitric oxide, which is a potent vasodilator. It helps in dilating blood vessels and arteries and ensures smooth blood flow throughout the body. Consumption of foods rich in vitamin C minimizes the risk of various types of cancer. High doses of vitamin C improves symptoms, prolongs life of cancer patients and makes cancer therapy more effective. The load of free radicals is high during cancer. As vitamin C is a natural antioxidant, it helps in the removal of free radicals and prevents further worsening of the condition. Vitamin C causes cancer cells to commit suicide and thus it reduces their population. Eating vitamin C-rich foods is a natural rejuvenation therapy. Skin aging is induced by oxidative stress. 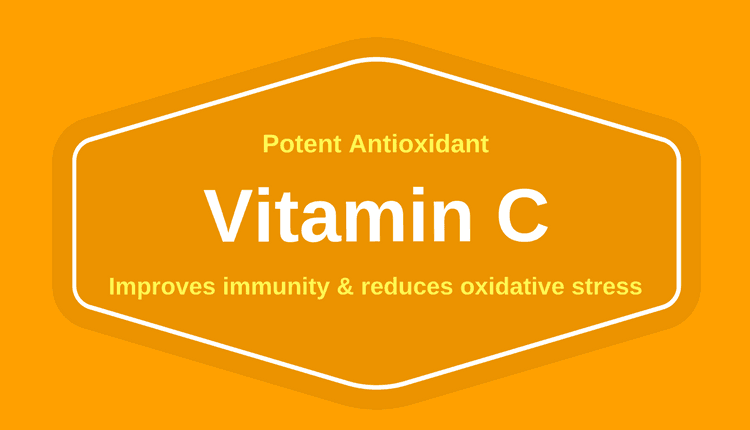 Vitamin C is a potent antioxidant that neutralizes reactive oxygen species formed due to exposure to ultraviolet rays. It protects the skin proteins against damage and gives you a more youthful appearance. Furthermore, vitamin C boosts collagen production, a skin protein responsible for skin firmness, strength, smoothness and elasticity. In addition to protecting the skin against damage, vitamin C brightens the skin tone, helps in lightening pigmentation caused due to acne and evens the skin tone. Eating foods rich in vitamin C or taking supplements is a great solution for people with muscle pain and sore muscles. This is often experienced post exercise and is quite common in athletes. High level of certain enzymes indicates muscle injury and stress. Vitamin C reduces the concentration of such enzymes and relieves overall muscle damage. Free radical generation increases during strenuous exercise. They harm the muscles and cause muscle aches. Vitamin C interacts with these free radicals and terminates their harmful reactions. Vitamin C plays a huge role in improving heart health and in keeping heart attacks at bay. It minimizes the risk of heart diseases by improving health of the blood vessels and arteries. Vitamin C reduces clot formation and ensures smooth blood flow throughout the body. It decreases stiffness of the arteries, lowers hypertension and improves altered lipid profile, the major risk factors that play a vital role in the onset of heart diseases. Vitamin C appears to be an effective therapy for acute as well as chronic pain. Muscle pain can be a symptom of severe vitamin C deficiency. Pain in the neck, spine, lower back and arthritis can be resolved by high intake of vitamin C. This is possible because vitamin C exhibits analgesic properties that helps in relieving pain. It regulates the cells of the skeletal system as well as hormones that play an important role in bone growth. Studies have revealed that vitamin C plays an important role in preventing osteoporosis and bone fractures. It is essential for the normal development of the bones and production of collagen, a protein found in bones. High intake of vitamin C can benefit people with asthma and improves their lung function. It reduces symptoms of asthma such as wheezing, cough, chest-pain and fatigue.